This week is National Trucking Week in Canada, from Sunday, September 3 to Saturday, September 9, 2017. The Canadian Trucking Alliance (CTA), the country’s national trucking group, in conjunction with the provincial trucking associations, launched National Trucking Week 19-years ago. The purpose of the week-long celebration is to highlight and recognize the important role and contributions made by the more than 400,000 Canadian men and women who keep the country’s freight moving. 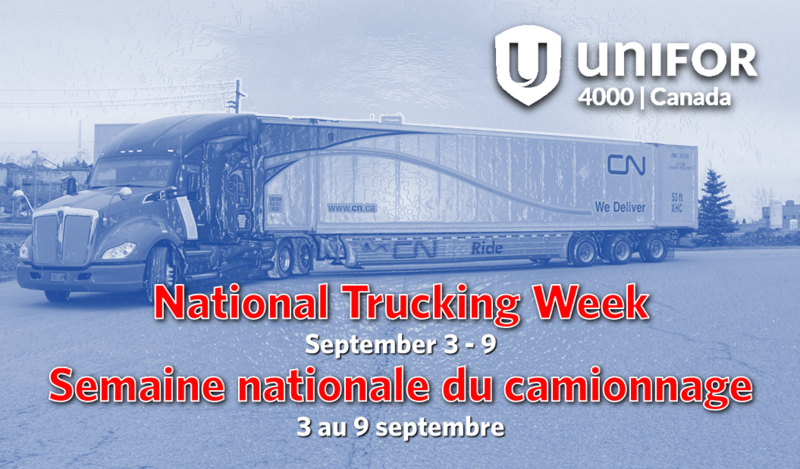 Provincial trucking associations, carriers, industry suppliers and other stakeholders undertake in various activities throughout the week to mark this important event. Unifor National Council 4000 represents more than 960 Owner-Operator truck drivers at Canadian National Transportation Ltd. (CNTL), a subsidiary of Canadian National Railway, DHL Express Canada and Loomis Express. These members are a very important part of our Union and the make-up of Unifor National Council 4000, which represents some 5,066 Unifor members all across Canada, largely in the Transportation sector. Unifor Council 4000 and our five Regional Local Unions congratulate Canada’s truck drivers, and of course those who are our members. They play a significant role in our daily lives by transporting various goods across North America and in our local communities. We wish them Solidarity, and Happy National Trucking Week!